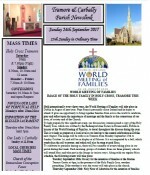 Held internationally every three years, the World Meeting of Families will take place in Dublin in August of next year. Pope Francis personally chose Ireland and he hopes to attend. It gives an opportunity to bring together families from across the world to celebrate, pray and reflect upon the importance of marriage and the family as the cornerstone of our lives, of society and of the Church. To help prepare for this significant event, our diocese has commissioned a copy of the Holy Family Icon, which was written by the Redemptoristine Sisters in Drumcondra, Dublin in honour of the World Meeting of Families, to travel throughout the diocese during the year. This is to help us prepare at a local level as we lead up to the central celebration in Dublin next August. The image will be with us in Tramore from Monday September 25th to Sunday October 1st, and will be on display at all Masses. It is accompanied by a bell, which symbolises the call to prayer, and which will also be rung at each Mass. Tuesday September 26th: Rosary for the intention of families at the Marian Terrace Grotto at 4pm, in the presence of the Holy Family Icon, weather permitting. If the weather is wet, the rosary will take place in the church. Thursday September 28th: Holy Hour of Adoration for the intention of families in Holy Cross Church from 4pm to 5pm. This will be a led holy hour incorporating the rosary, reflections from Pope Francis and from Scripture. The hour concludes with solemn benediction and reposition of the Blessed Sacrament. A number of families from our parish will also take part in our weekend Masses, assisting with the prayers, offertory and the ringing of the bell. 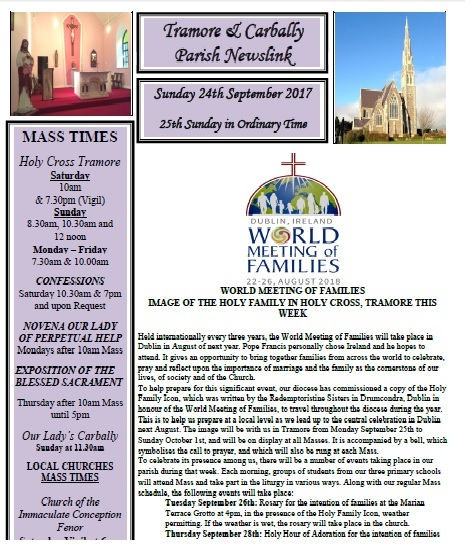 This will be a clear sign to all that families are at the heart of our parish community and that the Church is indeed a ‘family of families’ (Pope Francis). Please keep these events in your prayers, and that many families may be renewed and strengthened in their faith commitment through our efforts.